Waves crash crash on a pier at Pensacola Beach as Hurricane Michael make landfall. A woman makes her way on Oct.10, 2018 to an evacuation shelter at the Donald L. Tucker Civic Center on the Florida State University campus in Tallahassee. Hurricane Michael has forced thousands of residents to flee their homes. At landfall, it was nearly a Category 5 storm that smashed records as the strongest ever to roar onto the state’s exposed Panhandle. High winds and heavy rains lashed the coast. A quarter of a million homes and businesses already were without power, and the number was rising rapidly. It could reach into the millions from the “potentially catastrophic” Category 4 storm with sustained winds of 155 mph – just 2 mph short of Cat 5 status. By 8 p.m. EDT, the storm’s winds had dropped to Category 1 strength at 90 mph and it was moving northeast at 17 mph. It was centered about 20 miles southwest of Albany, Georgia. Betty Wexler, 86, lost a beach house to a storm more than 20 years ago. She remembers finding her bed frame in the sand, her neighbor’s bathtub sitting inside it. She and her daughter booked a hotel room through Friday. Perry and Mollie Williams were riding out the storm in their “fortress” home a block from the beach with their three cats and Rottweiler. 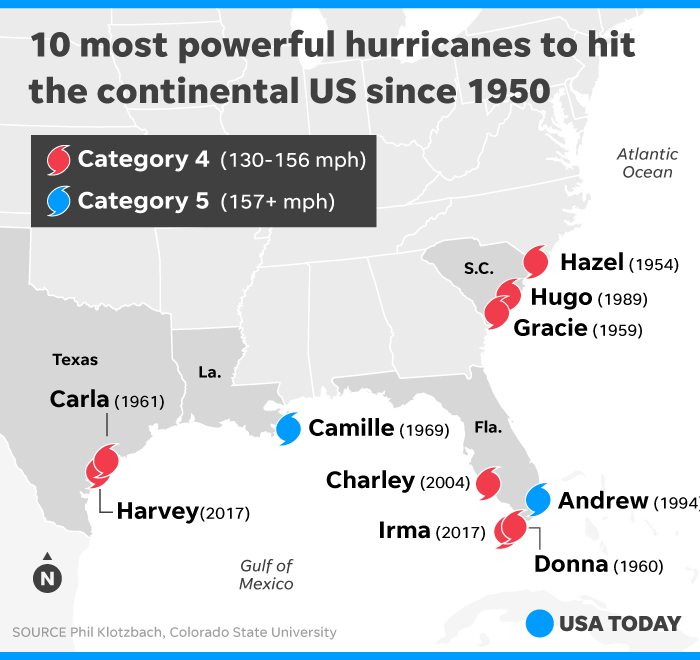 Michael’s barometric pressure at landfall was 919 millibars, by that measurement the third-strongest hurricane to hit the U.S. on record, trailing on the 1935 Labor Day Hurricane and Hurricane Camille in 1969. Gale and James Berry fled to a city shelter in Lincoln High School’s cafeteria. Gale Berry, 59, said their neighborhood was littered with debris and downed trees after Hurricane Hermine, which made landfall in 2016 as a Category 1 storm. She had no interest in riding out a Category 4 in her mobile home. 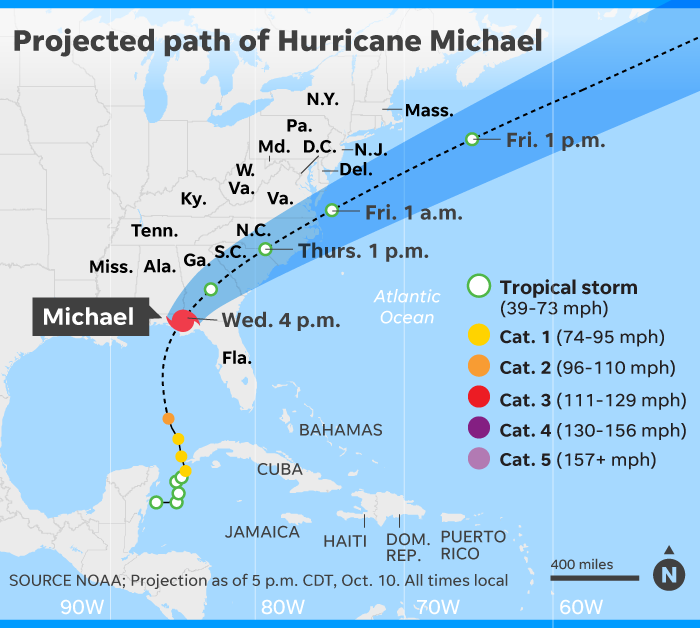 On a full-throttle journey from the Gulf of Mexico, the National Hurricane Center said Michael will bring “life-threatening” storm surge, hurricane-force winds and torrential rainfall after developing from a seemingly minor tropical storm off Mexico’s Yucatan Peninsula several days ago.